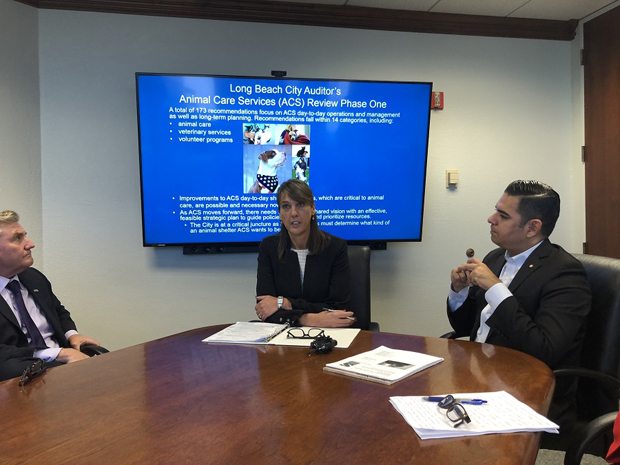 Phase One of the City Auditor’s two-part review of Long Beach Animal Care Services (ACS) indicated that the shelter has come quite a way from the time when it was just animal control. Now, however, with the care services descriptor in place, ACS is attempting to provide services beyond what resources can support, which has an impact on overall effectiveness and efficiency. The review was requested earlier this year by Long Beach City Mayor Robert Garcia and conducted by JVR Shelter Strategies, an independent animal-shelter-consulting firm hired by the City Auditor’s office. The review focused on shelter operations that included animal intake, veterinary services and programs designed for positive animal outcomes. The report noted that ACS’s staff is highly dedicated to the welfare of their charges; ACS takes in 8,000 animals a year, and compared with other open-admission municipal shelters (i.e., no pet is generally turned away within the shelter’s jurisdiction; however, euthanasia is performed when space is constrained), Long Beach’s shelter goes above “animal control” in attempting to provide service and performs above average in recognizing the need for programs that aim to increase positive outcomes for pets. Day-to-day operations that provide consistency, predictability and as a result, less stress for staff and animals are possible and necessary, the review also concluded. “There is an immediate need to standardize shelter operating procedures and practices, which include controls and industry best practices,” Doud’s office summed up. Numerous observations made during Phase One yielded 173 detailed recommendations under 14 categories such as animal care, veterinary services, adoptions and volunteer programs. Doud in fact observed a need for a full-time volunteer coordinator; the present position is part-time. The review also noted 103 short-term recommendations ACS has already begun to implement with $50,000 in one-time funds granted via a City Council vote, according to Doud. ACS has a $5 million annual budget, and next year’s includes two shelter-staff positions: a full-time registered vet technician to help with medical assessment, and an extension of the part-time social-media/marketing position to full time. Social media, said Parks, Recreation and Marine Director Marie Knight, is the real venue for adoptions. Trying to do more with less, however, has become increasingly difficult, and input from stakeholders, including the animal community, indicate a desire to eliminate euthanasia except for cases of extreme illness and get as much live release as possible. But this takes resources, and Doud indicated a stagnation of these resources. And many in the pet-welfare community would love the shelter to be everything possible. And this takes strategic planning and a clear vision. “Currently, there is a misalignment between stakeholder expectations and ACS’s capacity of care. As a result, the City is at a critical juncture. Stakeholders—City-elected officials, City management and employees, and the community— must determine what kind of a shelter it wants ACS to be,” read a statement from the City Auditor’s office. Stakeholders in the shelter need to clarify and solidify their vision to develop a strategic plan that will guide policies and practices, outline initiatives and programs, and marshal and prioritize resources, the City Auditor’s office stated. The Society for the Prevention of Cruelty to Animals, Los Angeles shares the P. D. Pitchford Companion Animal Village with ACS. spcaLA is a private rescue that holds the lease on the property; in turn, it sublets the building to ACS for $5 a year. spcaLA pulls pets for adoption from ACS and is responsible for shelter adoptions as well. Currently, states the City Auditor’s office, while the success of the two facilities is linked, the City’s leaseback agreement with spcaLA does not address how they should work together. The strategic plan should therefore address the consideration of a formal operating agreement with spcaLA. Phase Two of the study should be completed by the beginning of 2018, with an updated report forthcoming three months from that time. The second phase will address budgeting for staffing and resources. It will be considered a benchmark, comparing the resources and staff of ACS with those of other shelters. Garcia pointed out the difficulty of comparison when different factors such as municipal versus nonprofit, space constraints, intake and staff size are considered. The City Auditor’s Office is conducting additional work to assess ACS staffing and resources; once Phase Two is completed, a second report will be issued with the Office’s results and recommendations. The complete Animal Care Services Phase One report can be viewed here.